Christmas morning in my parents house is the same every year. We wake up, head to the living, open presents, then have breakfast. What we eat for breakfast is a tradition too. There’s a selection of Polish sausages, ham and other cold cuts, pate, rye bread and Babka. The meal isn’t fancy, but it says Christmas to me. This year, since the Daring Bakers challenged us to make Stollen, we replaced the babka with it. 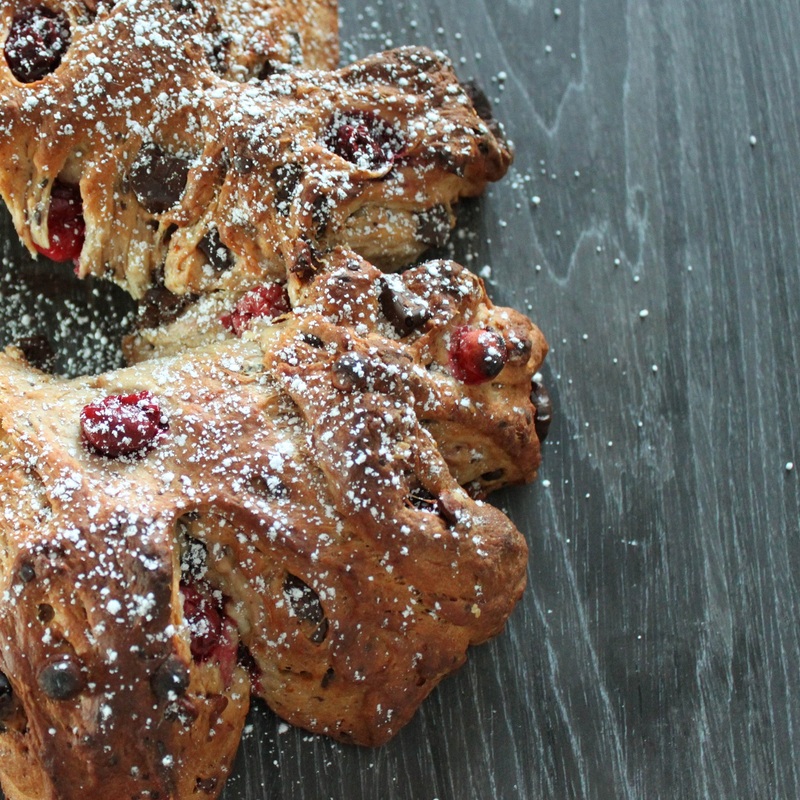 Stollen is a traditional German Christmas bread, made with dried fruit. Penny added a twist to the challenge by asking us to make it in the shape of a wreath. I actually made the recipe 3 times. The first time was a test run; I halved the recipe and baked it in a loaf pan. Unfortunately I took the bread out of the oven too soon, so the middle was not cooked through. The ends tasted wonderful though. The second time I made it for an office brunch. Once again I used half the recipe, and I replaced the dried fruits with chocolate chunks, cinnamon chips, and cranberries. 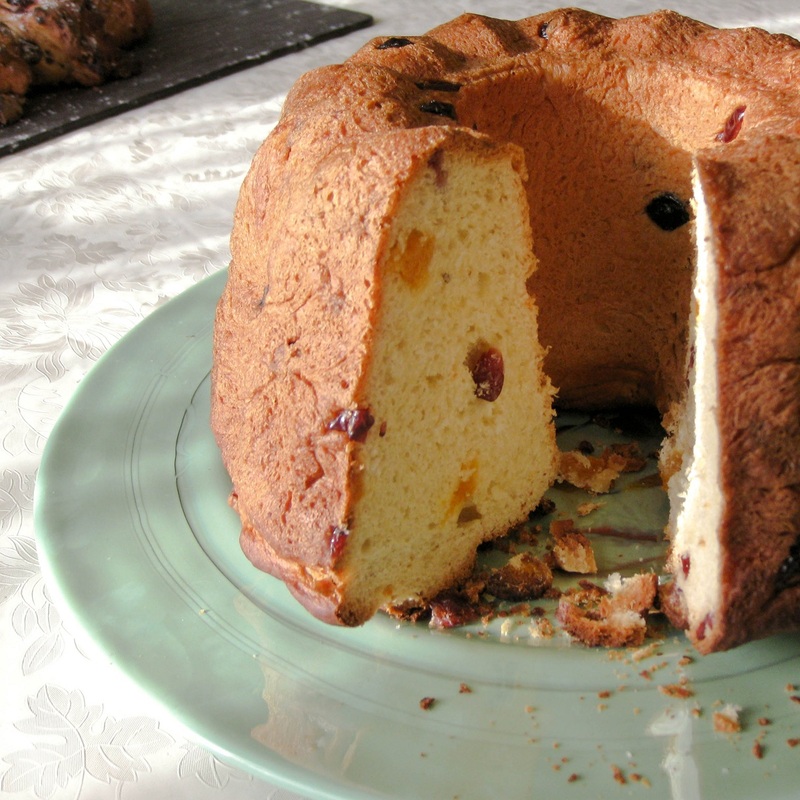 I shaped it like the Premiere Moisson Chocolate Cranberry Christmas bread, several balls of dough placed in a round pan. It was beautiful, and my coworkers seemed to love it. Unfortunately I didn’t take any pictures. On Christmas Eve I baked it for the third time. Part of the joy of Christmas morning is slathering butter on a slice of babka, so I decided to split the recipe in half, part of it became a wreath and the rest was baked in a bundt pan so that we could cut off nice slices. I used the chocolate cranberry mix for the wreath, and the traditional dried fruits for the bundt. Both turned out great. I’m glad I took the time to do the test runs, they gave me a chance to figure out how the dough rises and bakes. The recipe calls for an overnight rise in the fridge, however I also tried just letting it rise in a warm draft free space for two hours. Both ways worked well, and the taste was identical. Thanks for a great challenge, Penny! 3 cups dried fruits that have been soaked in rum or orange juice (I used cranberries, apricots and blueberries) OR 1 cup cinnamon chips, 1 cup chocolate chips, 1 cup fresh or frozen cranberries. Then stir in (or mix on low-speed with the paddle attachment) the yeast/water mixture, eggs and the lukewarm milk/butter mixture. This should take about 2 minutes. It should be a soft, but not sticky ball. When the dough comes together, cover the bowl with either plastic or a tea cloth and let rest for 10 minutes. Add the dried fruit and knead for 8 minutes (6 if using an electric mixer fitted with a dough hook). If using the chocolate cranberry filling, start kneading with just the chocolate and cinnamon chips, then add the cranberries towards the end being very careful so that the dough doesn’t turn pink. Place dough in a greased bowl and cover with plastic wrap. Let rise in a warm dry place for two hours, or in the fridge overnight. Punch the dough down and form into your desired shape. Let rise for 1 hour. Preheat the oven to 350. The time to bake the dough will depend on the shape chosen. Using half the dough, the wreath took 35 minutes in my oven, and the bundt took 50 minutes. Oh wow, chocolate and cinnamon chips – sounds devine! I took my chances and only made one wreath but was very happy with the flavor and texture of this bread.. it’s a wonderful addition to a Christmas brunch. Your families morning sounds much like mine.. just little breakfast goodies :) All of your test runs here are gorgeous! 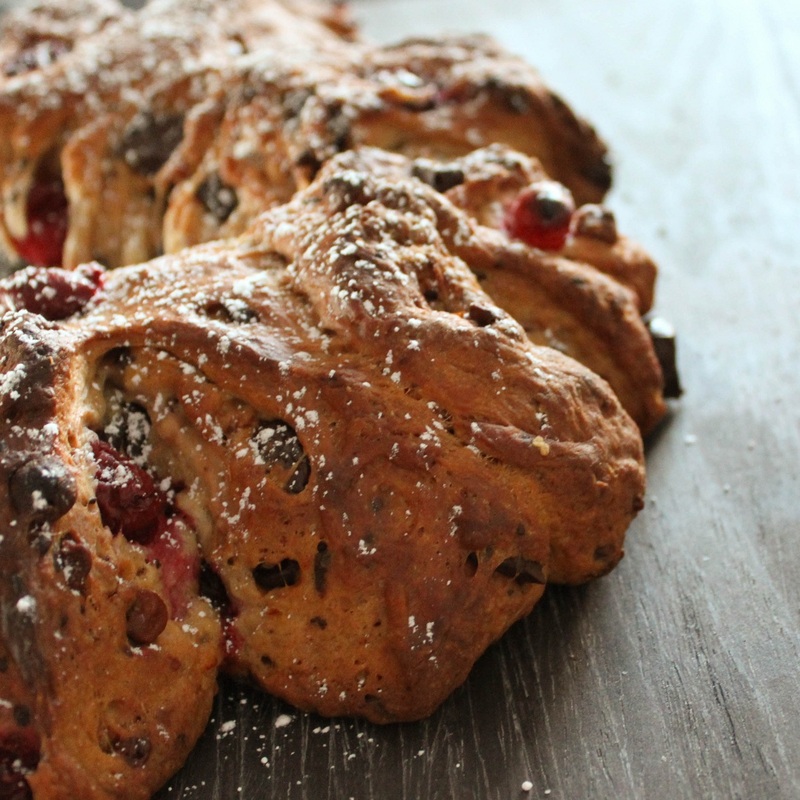 This stollen is beautiful! I have never had stollen before though, but I can tell just by looking at it that it’s something I would love. I just love bread in general…. especially beautiful bread like this one. I’d say you nailed the recipe! Three times, it would seem. Yum. 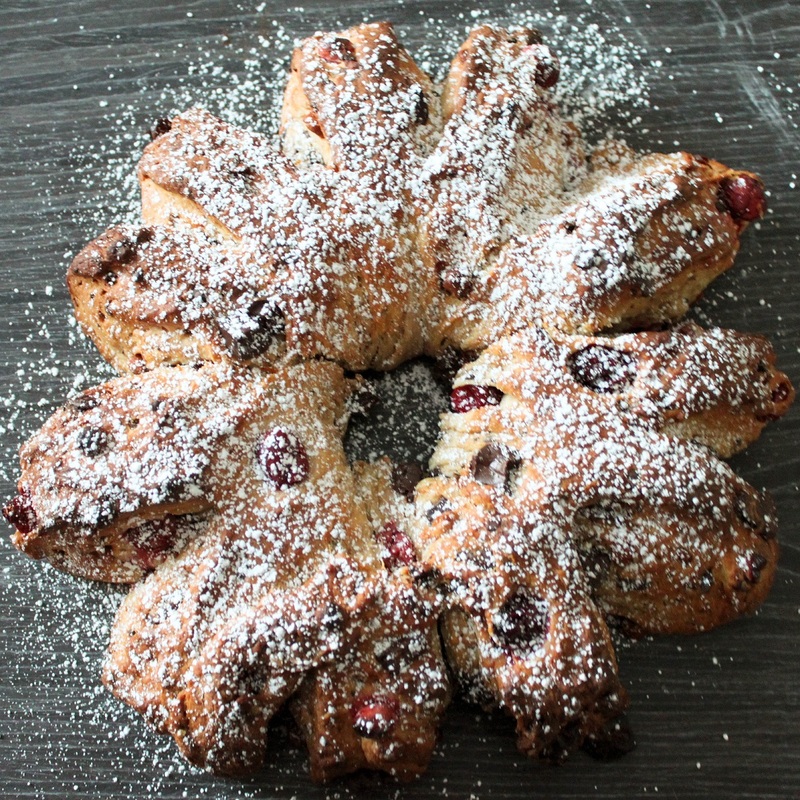 is the first time I see a stollen shaped as a wreath and looks great. and the addition of chocolate and cinnamon chips makes it very tempting. Yay for Stollen, great job! All the stollens were amazing, I’m wanting to join Daring Bakers! You should join! I love being challenged to make things I would probably never have done on my own. This is one ever-loving gorgeous stollen. I’ve had so many that were tired (and I’m not complaining because I have never made it). I love that you did trial runs. It was worth it. It looks to be perfection. Lovely looking stollen! I like the sounds of you additions. I’m also happy to hear it works well if you half the recipe! I love Stollen! This looks great!! Congrats on making Food Buzz Top 9!!! I don’t know which is more beautiful… the wreath or the bundt? The wreath looks positively Christmas-y with the red fruit and dusting of sugar. And the bundt’s interior looks so moist!